ATLANTA -- It was late March. There were 10 games left in the regular season for the Cleveland Cavaliers and the team found itself in crisis mode. After losing in embarrassing fashion to a shell of a Brooklyn Nets squad that had been in the tank for months, Cavs coach Tyronn Lue gathered his group in the ballroom at the Trump SoHo New York it was staying at for a planned film session. What came next was Lue challenging his team -- and Kevin Love in particular -- with language seemingly lifted straight from Samuel L. Jackson's "Pulp Fiction" character, Jules Winnfield. "You want the real message?" Lue asked as he walked away from the podium after the Cavs won its second playoff series in a sweep -- edging out the Atlanta Hawks in Game 4 with a 100-99 win. "And I said, 'Kevin, you got to be more aggressive. Tell LeBron, I'm a bad m-----f----- too, so throw me the ball.' Be aggressive. Run the floor. If you're open, we got to throw you the ball. You got to demand the basketball and I said, 'Score the ball and be aggressive.'" The meeting, earlier reported by Cleveland.com's Chris Fedor, was a watershed moment not only for Love, but for Lue as well, as the rookie head coach found the right button to push at a crucial time for his team. Cleveland has a 14-4 record since then, including a perfect 8-0 in the playoffs, with Love seemingly a changed man. He has put up a double-double in every game the Cavs have played in the postseason. His previous longest such streak since joining Cleveland was five games in a row. 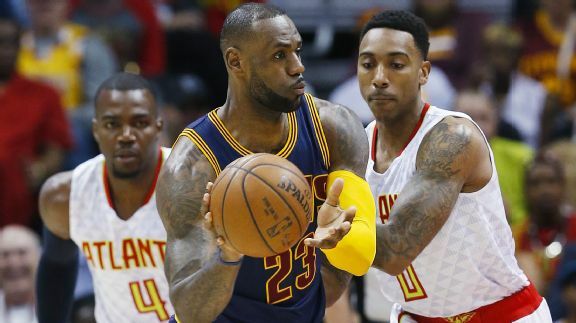 The Cleveland Cavaliers swept the Atlanta Hawks from the playoffs for the second straight year with a 100-99 Game 4 win. Love was again the Cavs' catalyst on Sunday. After the Hawks jumped on Cleveland early, going up by 12 in the second quarter, Love put up 15 of his game-high 27 points and seven of his game-high 13 rebounds in the third. Irving's voice trailed off before he punctuated his point: "He put us in a great position." Love might never have gotten to a point to get the Cavs there if not for Lue's words in New York. "I mean, Ty has played with, and had to go against, a lot of bad m----f------. So to get that, especially from your head coach, it's a lot of confidence," Love said. He was alluding to Lue's playing days when he teamed up with the likes of Kobe Bryant, Shaquille O'Neal, Tracy McGrady, Dirk Nowitzki and, the baddest of them all, Michael Jordan. "And I have been one in this league. [Lue] just wanted me to go out there and show it." The Cavs have coveted the light Love is providing, as he's averaging 18.9 points and 12.5 rebounds in the postseason -- the type of numbers he put up when he was an undisputed star for the Minnesota Timberwolves. "A lot of stuff I saw him do in Minnesota -- early duck-ins, trail [3-pointers] -- he's doing it now for us," Tristan Thompson said. "You can see it in his face and the way he approaches the game that he's a dog. He's a dog in this league and he can go at guys, and that's what we want from him every night. To bring that out and attack." As Love has shown the fight he has, his teammates have fought for him in turn. "I think you can tell by our bench reaction," Iman Shumpert said when asked what it's like to see Love find his role. "When certain guys find their groove or certain guys reap the benefits of their hard work, we all go crazy for them. And I think that's starting to build that trust with one another and it couldn't have happened at a better time." It has been quite the ride for Love these playoffs, reminding the basketball world of what he's capable of doing after he became an afterthought -- or even a redundancy -- when the Cavs got to the NBA Finals without him last June. He's proving his worth (and proving his potential) all over again this spring, helping to improve Cleveland's postseason mark to 12-0 all-time when he, James and Irving play together. And his teammates can see the difference. "It's evident," said James Jones, one of Love's closest friends on the team and who sits next to him on the team plane. "We always say what occurs and happens behind the scenes, and off the floor, behind closed doors, and away from the court always finds a way to seep back onto the court. So, as you see his mood, his attitude stabilize, I think he has a comfort level and an understanding of our concepts. "... And so, like anything, once you get settled and you get your bearings, you can just let it go and you almost become automatic. And that's what his game has become. His game has become automatic where he's back to being Kevin Love that effortlessly goes out there and gets not just a double-double, he gives you a little bit of everything that you can imagine." It's a turnaround that was almost unimaginable in March, when Love still struggled to find his role nearly two full seasons into the Cleveland experiment. "It just gave me a huge boost of confidence knowing that he knew what I was capable of and that they were going to -- teammates -- were going to find me and feed me for the last several games and heading into the playoffs," Love said. "So I think that helped not only me, but all of us as a team. So, I think it's kind of helping everybody out." Everyone on the Cavs has a role these days as they sit eight wins away from the championship. If Love could find his niche with this group, there was hope for everyone. It started with a well-timed talk. "To me, it's not like, who is [No.] 1, 2 or 3," Lue said. "Like, you're the Big Three. We're trying to win. It doesn't matter whose team it is. It's Dan Gilbert's team, you know what I'm saying? You got to come out and you got to be productive every single night and ever since then, it's been great."